Michael Dubruiel: Pope's Second Encyclical to Focus on Jesus? Heard that it would be on social justice but this story which talks about a "book" seems to be talking about the subject of the next encyclical. Reading the article, it sounds to me like this writing would be just as it's stated, a book; the article noted that this was something that Benedict had started even before he had been elected Pope. 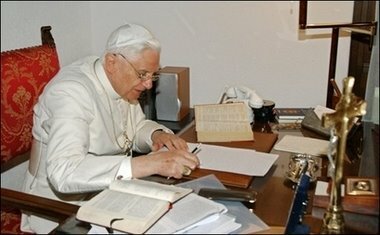 As we know, John Paul II had several non-magisterial books published so it's certainly possible for Benedict to do the same. The encyclical seems to me to be a separate work altogether.